Turkish official; born at Nicosia, Cyprus, in 1832. Educated on that island and in Egypt, he at the age of seventeen entered the service of the Egyptian government, afterward passing into that of Turkey, under which he has successively held the following important political positions: mayor of Touzla (1859); president of the administrative council of Saida; subprefect of Beirut, of Damascus (1866), of Aleppo (1867), of Philippopolis (1868), of Jerusalem, of Cyprus (1874), and again of Beirut (1875); and vali of Aleppo (1876). Resigning in 1878, he returned to office in 1881, being successively appointed councilor to the ministry of the interior, minister of pious foundations (1882), and minister of public instruction (1883). 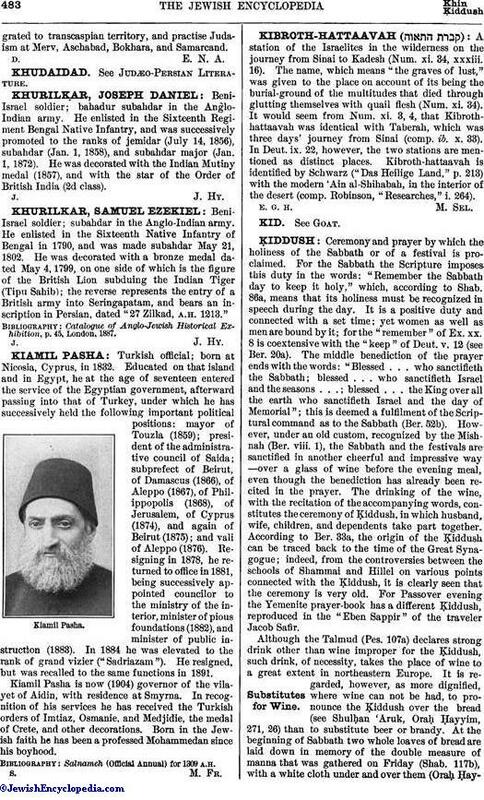 In 1884 he was elevated to the rank of grand vizier ("Sadriazam"). He resigned, but was recalled to the same functions in 1891. Kiamil Pasha is now (1904) governor of the vilayet of Aidin, with residence at Smyrna. In recognition of his services he has received the Turkish orders of Imtiaz, Osmanie, and Medjidie, the medal of Crete, and other decorations. Born in the Jewish faith he has been a professed Mohammedan since his boyhood. Salnameh (Official Annual) for 1309 a.h.